Start building your applications with intuitive, user-friendly menus and dashboards using powerful STM32 ARM Cortex-M4 microcontroller. 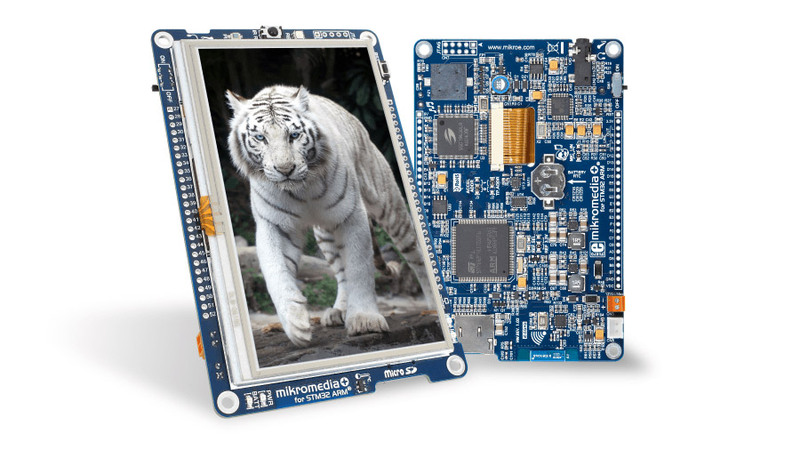 This board provides a compact high-quality multimedia development platform for STM32F407ZGT6 device. Nordic’s nRF24L01+ transceiver with active chip antenna will make you forget about wires. Drive it with simple SPI commands. It's that easy. mikromedia Plus for STM32 is fully supported by mikroC, mikrobasic and mikroPascal compilers for ARM. Compilers come with dozens of examples that demonstrate every feature of the board. Mikroelektronika has more than 300 click boards™ in the shop, from wireless transceivers and sensors to motor control click boards™ and displays.